You know how to boogie down with the best of them, but if you want all eyes on you when you hit the dance floor, you need a wild outfit to steal the scene. You could wear a blouse made entirely of t-bone steaks, but that would anger more than just those fiending for some red meat. You could wear next to nothing, but it gets cold inside some places! You could emblazon a custom t-shirt with some short, provocative opinion in vibrant comic sans—but that's likely not the attention you're seeking. 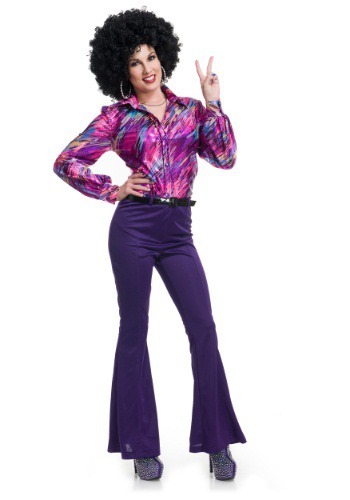 Or you could always, of course, enter the dance arena wearing this Women's Disco Queen Shirt. With a wild purple style, you won't have any problem having a look as vibrant as your dance moves. Just makes sure you've been practicing doing the hustle before you slip it on! This is the best blouse i ever bought! I can recommend it!